Mel Nichols, Bicycle Days (Slack Buddha, 2008), 32 pp. $6.00—I meant to write about this modest but compelling chapbook when I was reading through Hank Lazer’s 2002 Lavender Press book, Days. Lazer’s book is a different kind of travelogue/journal, and so the differences between his and Nichols’ work were interesting. Bicycle Days is less “ironic” than some of Nichols’ more recent, dare I say “flarfy,” performances, but as the term “modest” hints at, her more recent work has a confidence and force that is largely absent from this chapbook. That’s not a criticism. It’s precisely the measured uncertainty, the in and out, all about affect of painterly observation that sustains the movement from poem to poem. Nichols is as brutal as Dickinson is (“as the light came in between/the trees at dusk// Sky//I hate you”) and she knows how to use enjambment to mirror the travelogue effect of these poems, stanzas and lines: ”for your legs are tornadoes/ and the backyard becomes a forest in sheets/of blue archers shooting into the dark guild/ pink eastern edges taped to the entrance.” In order to break “the habits of the mind,” Nichols remains vigilant, on the lookout for the moment when “a man trips and/doesn’t fall,” for those moments when the everyday seems suspended in some elsewhere: “what time could it possibly be without money.” Of course, the aesthetic itself can force us to look afresh at what we too often miss in our cars or, the equivalent, staring down at our IPhones, skimming newspapers, skimming books like newspapers: “squander weedy this fluke or gobbledygook or/ bibliophile or brain or wheat-colored/ indeed ecstatic buckets of daytime/in the ellipsoidal notorious some.” Yes, alliteration and assonance, those old warhorses, can still serve lyric bursts of language. 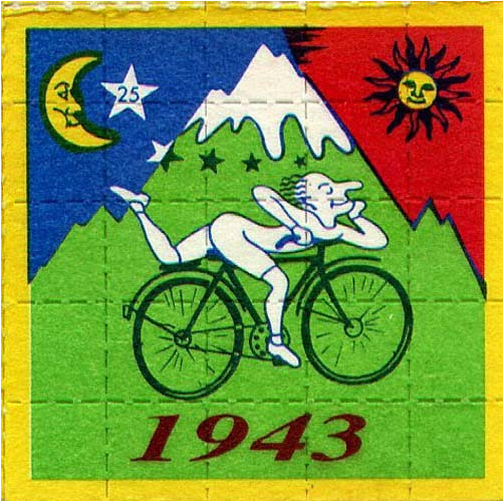 Bicycle Days is a lovely example of what is still possible within those old warhorses.